Erosion Repair: What are my options? As we continue to get rains that are more intense than we have seen in a long time, soil erosion is discussed by many who come through the office. Long term, operators are going to really need to look at the management of their rotation and tillage. Over that last several years many have removed hay from the rotation, taken out contour strips and have gotten away from no till. The bottom line is that to reduce erosion one must have some type of cover on the fields to protect the soil from these rains. Less tillage and more cover should be a big part of your management decisions. With that said, gullies are another part of the equation and they appear to be in several areas. Below are a few options to work on repairing gullies. A number of these gullies are in smaller watersheds (less than 5 acres) and can be corrected by using NRCS standard Critical Area Seeding (342). Approved seeding window for establishing grass is August 1 through September 15. Unfortunately, working between these dates will likely affect growing crops. Consider going into these areas in a month or so and do the needed tillage to smooth area, seed and mulch. This will give the area the best chance to establish grass, but at the same time may destroy some growing plants. An alternative would be to wait until after harvest to do tillage to smooth, seed and mulch. A seeding of perennial or annual ryegrass at 40 pounds per acre, or cereal rye at 50-100 pounds per acre can be placed up until November 1, as a temporary cover. This scenario allows for existing crops to be harvested, but increases the risk of not getting a good seeding and continuing to deal with the gully. Oftentimes, watersheds from 5 to 25 acres in size can benefit from installation of grassed waterways. 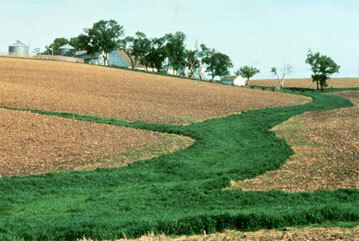 NRCS has an alternative design for such areas that can be used if the slope is under five percent. These waterways are parabolic in shape with a top width of 32 feet and a depth of one foot. Watersheds of greater than 25 acres or with slopes greater than five percent require a grassed waterway designed specifically for the given site. All areas are ultimately seeded with a permanent cover of Tall or Turf-type fescue at 40 pounds per acre along with 20 pounds of Kentucky Bluegrass, and 25 pounds of Perennial Ryegrass in the mix. Farm Service Agency (FSA) is presently taking applications for the Conservation Reserve Program (CRP) that will help with cost of installing Grassed Waterways and providing an annual rental payment for 10 years for the area installed. Sign up is now through August 17th. 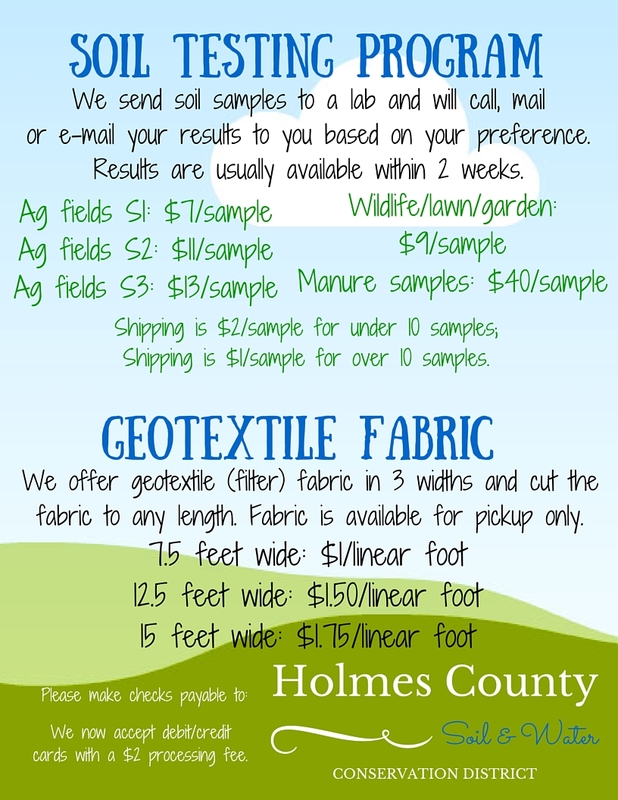 For more information on Grassed Waterways or any other conservation practice, feel free to contact the Holmes NRCS/SWCD/FSA office at 62 W. Clinton St., Millersburg, Ohio or give us a call at 330-674-2811 Extension 3.